We’d love your help. Let us know what’s wrong with this preview of The Silence of Bonaventure Arrow by Rita Leganski. From Harper Collins: Conceived in love and possibility, Bonaventure Arrow didn’t make a peep when he was born, and the doctor nearly took him for dead. No one knows Bonaventure's silence is filled with resonance - a miraculous gift of rarified hearing that encompasses the Universe of Every Single Sound. Growing up in the big house oh Christopher Street in Bayou Cymbaline, From Harper Collins: Conceived in love and possibility, Bonaventure Arrow didn’t make a peep when he was born, and the doctor nearly took him for dead. No one knows Bonaventure's silence is filled with resonance - a miraculous gift of rarified hearing that encompasses the Universe of Every Single Sound. Growing up in the big house oh Christopher Street in Bayou Cymbaline, Bonaventure can hear flowers grow, a thousand shades of blue, and the miniature tempests that rage inside raindrops. He can also hear the gentle voice of his father, William Arrow, shot dead before Bonaventure was born by a mysterious stranger known only as the Wanderer. To ask other readers questions about The Silence of Bonaventure Arrow, please sign up. It is this notion, of the past steering the present away from a true course, that drives the narrative in The Silence of Bonaventure Arrow, and in at least one way, it is the past that helps steer it back onto the road. If you liked Edgar Sawtelle, the story or film of Benjamin Button, the TV show Pushing Daisies or the more imaginary tales of Alice Hoffman, you will love this book, a tale imbued with a few large dollops of magical realism. Like Edgar, Bonaventure is born somewhat different from other children. Like Edgar, he makes no sound. But while Edgar has a particular Mowgli-like talent for relating to his pooches, Bonaventure is possessed of an otherworldly sense of hearing. The medical term for one aspect of this is synaesthesia. He is able to hear color. But his gift goes far beyond the odd skills that as many as one in twenty-three humans might have. As he grows into his gift, he can hear the stories of inanimate objects. Eventually, Bonaventure is able to hear at a molecular level. He is even able to hear sounds that happened long ago. Bonaventure never met his father, William, at least while he was alive. Before the boy’s birth, Dad was shot down on the streets of New Orleans by a madman known only as “the Wanderer.” But William hangs around, having a few tasks to complete before he can graduate from Almost Heaven, and helps his unusual son adapt to the world and complete his own mission. Bonaventure’s mother, Dancy, lives with a burden of guilt originating in the day her husband was killed. Dancy’s mother, Letice, carries a heavy load of sorrow from her adolescence. It is only through Bonaventure’s gift, with the help of his father, that these decent people can move ahead with their lives. Another force is at play here as well, in the person of Trinidad PreFontaine, maker of healing potions, and well versed in the potential of most plant life. She feels the presence of Bonaventure as if they are connected by a personal, psychic tether. She has a role to play as well in seeing Bonaventure realize his potential. It is easy for a story with a fair bit of magic in it to get caught up in the pyrotechnics (verbotechnics?) of the incredible. (See The Night Circus) But that is not a fate suffered here. We are acutely aware of the humanity of these characters, and it is their emotional life that drives the story. The Magic takes an appropriate, supportive role. We follow the Wanderer, a physically maimed and mentally ravaged war veteran, from his constricted life in Detroit, as he sets out on a mission of unknown origin, to the point of his deed, and after that we see him occasionally in an asylum. He is very fixated on Alexandre Dumas, particularly The Count of Monte Cristo. One wonders what the wrong is that he is avenging. It is possible that there may be readers who are put off by the obvious religious perspective presented in Bonaventure’s world. Like the Blues Brothers, some characters here are most definitely on a mission from God. Bonaventure Arrow had been chosen to bring peace. There was guilt to be dealt with, and poor broken hearts, and atonement gone terribly wrong. And too there were family secrets to be heard; some of them old and all of them harmful. One cannot help but wonder if Trinidad PreFontaine, given her evocative name, might have some sort of baptismal relationship with BA. But take it from this atheist. It is worth the weight of Leganski’s perspective to gain the benefit of this wondrous landscape. And she does offer an image, as well, of some who would use religion for unseemly purposes. In the middle of her sleepless night, Trinidad experienced a vision. A scavenging raven circled the room, its beady eyes questing after death. The bird spread its wings to swoop and glide, its feathers sounding like rustling silk. From the bird’s shaggy throat came a prruk-prruk call and a toc-toc click and a dry, rasping kraa-kraa cry. After the raven came a pure white dove, and after the dove, a sparrow. Trinidad regarded circles as symbols of God’s eternal love. Her favorite circle was that which is found in the small dark eye of a sparrow. Are sparrows the souls of these characters? Angels? Don’t know, maybe, or maybe something else entirely. Bonaventure associates another character with an eagle later in the book, keeping the bird imagery aloft. There are plenty more, but I will stop there. Some characters seem to have maybe a bit too much of a vision, if not always an absolute road map, directing them toward their goals. Trinidad certainly has a finger on the pulse of the force. William seems to have gotten a bullet-pointed memo from the Almighty in his in-box, and Bonaventure has his father to show him the way. While this may be tactically a bit convenient, strategically it supports the emotional journey of others. Bonaventure struggles to adapt to a world that is not all that accepting of someone as different as he is, particularly in the social cacophony of school, where he tries mightily to feel normal despite his large difference. I wish that we had gotten to see more of that effort. But the boy remains a pretty nifty character on his own for someone charged with helping change others. Really, it is the women whose journey we follow most here, Dancy, Letice, and Adelaide, Dancy’s awful mother, who could easily be a member of the De Vil clan, and who adds a layer of unpleasantness to the expression going postal. Along the way, Leganski offers a fascinating look at a time and place, New Orleans and the fictitious town of Bayou Cymbaline of the 1950s, primarily. The author, although from Wisconsin, and currently residing in Chicago, has a Southern heart. She has always been enamored of many great southern writers, Faulkner, Eudora Welty, Tennessee Williams, and Harper Lee, among others. That sensibility comes through. Despite her northern Midwest DNA, the soul of this book resides in the South. She all but strokes the landscape with her rich, languid prose. There are enough overt literary references to offer tethers to other works. Dancy is, like her creator, a huge fan of Faulkner. From a different, if no less wonderful world, C.S. Lewis gets a mention, as does Lewis Carroll. Leganski writes with conviction about a sense of god, but not in a good versus evil way, although there is a bit of that in this tale. Here the battle is, mostly, about good versus despair, belief as a tool to help one overcome barriers and find again one’s better personal paths. Her notion of god, while clearly Christian in origin, extends the concept to a sort of areligious universality. Hers is not one of those church-bound deities, but a wondrous extra layer of existence that embraces profound beauty, kindness, forgiveness and understanding. The Sinners in The Hands of An Angry God sorts are anathema here. The story of Bonaventure Arrow takes place in a universe of love, a universe in which bad things certainly can and do happen, but in which there are forces at work trying to heal wounds and make things right. In addition to lifting up some of its characters, this is a book that will lift up its readers. Enjoy it as pure fantasy if that works for you. Embrace the religious aspect if you prefer. The characters feel real and their struggles are all too mortal. The Silence of Bonaventure Arrow is most assuredly worth shouting about. March 18, 2013 - I just came across this - lovely interview with the author. It adds a lot to one's appreciation of the novel. Know what you're getting into: This is soooooper sentimental. Like a Frank Capra directing The Unlikely Pilgrimage of Harold Fry from a screenplay by Paolo Coelho, starring Michael Landon, with a soundtrack by Andrew LLoyd Webber level of sentimentality. Rita Leganski has built a sentimentality amplifier that "goes to 11". That being said, this is a great read. The prose is beautiful and the characters are surprisingly real for a story that involves voodoo, ghosts, and super hearing. Leganski's s Know what you're getting into: This is soooooper sentimental. Like a Frank Capra directing The Unlikely Pilgrimage of Harold Fry from a screenplay by Paolo Coelho, starring Michael Landon, with a soundtrack by Andrew LLoyd Webber level of sentimentality. Rita Leganski has built a sentimentality amplifier that "goes to 11". That being said, this is a great read. The prose is beautiful and the characters are surprisingly real for a story that involves voodoo, ghosts, and super hearing. Leganski's sense of place is amazing, and her sense of wonder is breathtaking. Bonaventure wasn't a quick read for me. Not that I wasn't rushing to get back to it, but my page-per-hour rate was much slower than usual, because the prose demands it. This novel was absolutely fantastic. It took me quite some time to get over the fact that this book had ended. I did not want to leave the world that Rita Leganski had created in this novel. The story within these pages sucked me in from the first page and it almost hurt me to close the back cover at the end. This was one of those novels that is so well written, I had to read parts out loud to release the beauty of the language into the world. Not only is Bonaventure's world magical, but so is t This novel was absolutely fantastic. It took me quite some time to get over the fact that this book had ended. I did not want to leave the world that Rita Leganski had created in this novel. The story within these pages sucked me in from the first page and it almost hurt me to close the back cover at the end. This was one of those novels that is so well written, I had to read parts out loud to release the beauty of the language into the world. Not only is Bonaventure's world magical, but so is the writing of Leganski. She wrote so beautifully, I had no choice but to run away with Bonaventure, William, Dancy, and the Wonderer. Before he is born, Bonaventure Arrow’s father is murdered by a mentally disturbed man known only as “the Wanderer.” His mother’s unspeakable grief affects Bonaventure’s development – he is born mute, but with hyper-acute hearing. He can hear earthworms moving through the dirt and a bit of dust falling off a moth’s wing. He can also hear the stories that inanimate objects tell – the sound of steamships comes from a wooden crate marked “port of New Orleans,” and the sounds of gunshots from a jar of sassafras. And he hears the sadness and secrets of his paternal grandmother’s house. Helping him make sense of these sounds are two extraordinary characters – the ghost of his father, William Arrow, whom only Bonaventure can hear, and the family’s cook, Trinidad Prefontaine, who is a Creole woman knowledgeable about hoodoo and root work. Leganski’s work is hard to describe. It has elements of Southern gothic, as well as the supernatural and magic. When I first heard that the central character is a mute child, I immediately thought of David Wroblewski’s The Story of Edgar Sawtelle. But this novel is nowhere near so fine a work of literature as Wroblewski’s. I think Leganski got too caught up in the “magical” quality of Bonaventure’s extraordinary hearing. She spends way too much time crafting beautiful descriptions of his abilities – and they are beautiful. But, how does reading about a dust mote’s story of being carried across the Himalayas on the foot of a goose help this story? The answer is it doesn’t. These type of passages (and there are many) showcase Leganski’s imagination and ability to write creatively, but they interfere with the story. They do nothing to develop the characters or advance the plot. They are unnecessary distractions. There is a nugget of a great premise here. I like how she used the innocence of a child to help the wounded adults around him heal. I liked that Bonaventure was surrounded by people who loved him and nurtured him – maternal grandmother notwithstanding. I wish she had spent more time developing the story, and less time expounding on Bonaventure’s unusual hearing abilities. I was interested and caught up in the plot at the beginning, but then felt she would never get to the point. By the time the identity of William’s killer was revealed I just didn’t really care. Had I been her editor, I would have deleted close to a hundred pages. I would have deleted the maternal grandmother’s storyline and expanded on his teacher’s growing relationship with his mother. I would also have advised her to make more use of Trinidad, who doesn’t join the family until half-way through the novel. I get that Leganski was going for an ethereal quality, but I think she went too far in that direction and forgot the story. To read what Shannon, Kaitlyn and Suman I read a lot of books but rarely do I read one that reminds me of why I love to read. The Silence of Bonaventure Arrow has all the hallmarks of great storytelling but what makes it so special is the feeling it evokes with the reader. Yes, you will love the language, the characters, and the twists, but most of all you will love the experience of reading this book. In her luminous first novel, author Rita Leganski has hooked me for life. More, please! When what seemed like the entire Internet went crazy for this book, I decided to check it out. On the surface, it should have been a favorite. After all, it's set in my beloved New Orleans and brimming with magical realism. I expected to find something I'd at least like, but I wasn't holding out hope of discovering a new favorite. What I actually found, however, was almost offensive. Style and content obviously cribbed from the awesome Sarah Addison Allen, only filled with heavy-handed proselytization to spice things up a bit. The omniscient narrator's descriptions of pregnancy and later, abortion, make it abundantly clear that this book should certainly be shelved with the Christian fiction. Not only is the description of abortion graphic and scientifically dubious; we're also forced to endure the hand-wringing and pearl-clutching of Letice's guilt as she struggles to come to terms with her remorse over a decades-old backroom procedure she was forcibly subjected to. This moral agony is so strong that she actually builds a personal chapel so she can keep begging for divine forgiveness. The character is defined by this guilt, until she becomes nothing more than a Roman Catholic cautionary tale in sackcloth and ashes. Bonaventure, the boy who can hear the pots in the kitchen telling stories about warming bottles for him as a baby (no, really) is the almighty vehicle that doesn't speak so that he can hear enough to heal the world. Pages and pages are spent on description of his ability to hear powder falling off of moth's wings, along with his advanced IQ and perfect disposition. He never misbehaves, he never gets angry and he reacts to the ostracism of his peers with blessed acceptance. Ugh. I will give Ms. Leganski credit for skillful exposition, I just hated her preachy tone. We're reminded over and over that voodoo is a bad thing and feigned Christianity is a bad thing and disbelief is a bad thing, while abortion is the absolute WORST thing. If you're into heavy-handed Christian rhetoric masquerading as something a bit more exciting, you might be pleased with The Silence of Bonaventure Arrow. Otherwise, I wouldn't recommend it. I suppose this falls under the category of magical realism. I actually never knew exactly what that was but I thoroughly enjoyed it. It is fun to be immersed in a story where one might believe in guardian angels, that loved ones who have passed on can reach out to us and that some people may have other worldly gifts that can be used to help or heal others. Of course this only works if it is well written and this definitely is. Love the time period - 1950s, the Cajun culture and New Orleans setti I suppose this falls under the category of magical realism. I actually never knew exactly what that was but I thoroughly enjoyed it. It is fun to be immersed in a story where one might believe in guardian angels, that loved ones who have passed on can reach out to us and that some people may have other worldly gifts that can be used to help or heal others. Of course this only works if it is well written and this definitely is. Love the time period - 1950s, the Cajun culture and New Orleans setting. There is a great cast of characters. Many to love and only a few to hate. I always enjoy having a strong child character/perspective - it offers so much more. Even the names are magical. Bonaventure Arrow, Trinidad Prefontaine, Bayou Cymbaline. And how nice to have satisfying and happy endings/closure. There were a couple of incidents that were a little too graphic/macabre for me but thankfully the sweet and humorous aspects of the story helped to balance it. This was a nice change of pace - very different form anything else I have read. I will look forward to more from this author. Okay book, I'm pretty sure it was me and not you. Listen, I saw you and you were beautiful, and I wanted you right away. I couldn't resist your allure, your magical realism. I had to have you in my life. Now, though, I realize that I should have gotten to know you better first, before we committed to one another in any meaningful way. You really are beautiful inside and out, but just not in a way I can fully appreciate. What I can say is that the writing in The Silence of Bonaventure Arrow is bea Okay book, I'm pretty sure it was me and not you. Listen, I saw you and you were beautiful, and I wanted you right away. I couldn't resist your allure, your magical realism. I had to have you in my life. Now, though, I realize that I should have gotten to know you better first, before we committed to one another in any meaningful way. You really are beautiful inside and out, but just not in a way I can fully appreciate. What I can say is that the writing in The Silence of Bonaventure Arrow is beautiful. Simply lovely. Leganski's writing style plays into the feeling of magical realism perfectly, and the way she puts together sentences has a magic all its own. Her debut proves her writing chops, and I would be willing to consider reading whatever her next novel is, solely on the strength of her prose. The book's opening captured me immediately, reminding me a good deal of Fitzgerald's short story "The Curious Case of Benjamin Button" mixed with the southern charm of Sarah Addison Allen. The idea of a child, mute but intended for some big purpose, seems fraught with possibility. Unfortunately, the story then jumps back and spends almost the whole of the novel in the backstory of his mother and grandmothers. I never did find myself especially interested in any character but Bonaventure Arrow himself, and he didn't turn out to be much of a focus in the novel. Bonaventure, in addition to being silent, has super hearing. He can hear everything, from falling stars to his father's ghost. Supposedly, this will allow him to do something quite special and live up to his saintly name. His counterpart of sorts, in the sense that they both have special abilities, is Trinidad, a much older black woman. She sees visions, Knowings, and practices hoodoo, which allows her to help people with natural herbs. Her hoodoo is remarkably similar to the effects of Vianne's chocolates in Chocolat. These elements are fantastic, but I don't feel like they served any actual purpose to the plot whatsoever. They seem merely to be there to make the setting more vibrant. Actually, the only real plot seems to involve Bonaventure's father. William dies before Bonaventure's birth, shot by a mysterious, insane man. His mother and wife are trying to allay their guilt, the former by trying to figure out the identity of his killer. Meanwhile, William, in some sort of purgatory, watches over his family, and communicates with his son. The whole book seems mostly to be about him moving on to the next world. Rather than magical realism, this is much more of a ghost story. What lost me, most heartily though, was all of the Christianity in the novel. No, it's not preachy, but it's incredibly boring. As I said, I couldn't be bothered about the backstory of the grandmothers, and their pasts are all wrapped up in their fervent religious beliefs. Every character isn't Christian, and it doesn't seem like Leganski's trying to say anything about it, but I just had no fucks to give about any of it. Like so much else in the novel, I just don't see why I had to sit through all of that when it doesn't seem to have had a big impact on the plot overall. I won this book from GoodReads! Wow, I loved this book. Although there wasn't a lot of dialogue, this book spoke to me so loudly and clearly that it was hard to put down. I hope this wasn't Ms. Leganski's first book as I need to read more of her. This was a wonderful story with lyrical writing in a place dripping with southern charm and character. Bonaventure is a boy born without speech but the ability to hear far beyond what most people can hear. What I took from it is you can hear so much more if you keep your mouth shut and listen. A truly magical read. What a wonderful read! Just marvelous! It comes out in February so promise to watch for it! I absolutely adore this book! I received this in the mail just a few days ago (won it in a Goodreads giveaway) and started reading it immediately. It's a fun, heartwarming read with delightful writing. Absolutely loved it. Strongly considered giving this one a 2 star, but I could not. Primarily because of the lyrical, poetic, poignant passages describing Bonaventure and Trinidad's defining properties. But overall, this entire book just did not work for me. And that's despite the easy read and yet beautiful language of the writing flow. First of all, I'm beginning to abhor magic realism. Not dislike. In our all too real world it's starting to feel not only silly, but mostly sappy to the point of dangerously dissocia Strongly considered giving this one a 2 star, but I could not. Primarily because of the lyrical, poetic, poignant passages describing Bonaventure and Trinidad's defining properties. But overall, this entire book just did not work for me. And that's despite the easy read and yet beautiful language of the writing flow. First of all, I'm beginning to abhor magic realism. Not dislike. In our all too real world it's starting to feel not only silly, but mostly sappy to the point of dangerously dissociative. But just like the Dicken's orphans or other pure innocents of good intention fused with inborn wisdom, there does exist an audience (endlessly in all eras) for these extremely sweet and saccharine idealistic models. Or magically so in some regard of their identities. Pollyanna with super skills! And I can completely understand the attachment and their enjoyment of fairy tales. On top of it I wanted to hear much more about Trinidad than I wanted to hear about The Wanderer or his sorry tale. If you like magic realism you will like this one, because it is sentimental to the extreme and filled with rather gothic proportions of karma's excuses? Sob story reasoning that inspires and closes into a complete circle- all neat? I would give 10 stars. This is a gem. You are allowed to see the story unfold, learning the secrets before the characters do. Lovely relationships and interesting plot developments. And a big plus is that you know it has to end well, because the bad stuff happens at the beginning. I cannot recommend this book more highly. Wonderful respite from the nightly news. A spirit moved among them, and watched them and loved them. It was the love that disquieted her, for it was the kind of love that doesn't know when to leave itself to memory. 3.5 stars. I enjoy magical realism, so I liked this story. I especially appreciated the beautiful descriptions about Bonaventure's silence. I loved the stories everyday objects shared with him. It was very special getting to know a character from the moment of conception. That rarely happens in any book, and as I mom it makes me feel all warm and fuzzy. I recently read another book about hoodoo, and wasn't sure how it differed from voodoo. The Silence of Bonaventure Arrow cleared this up for me. I must admit I was expecting more from this book. Although I enjoyed it, it's not a book that will stay with me for a long time, and it should have been. It has all the elements to make it one of my favorites. I was sick and in bed when reading this, and think this played a big part in my feelings. So for her next book, I'll be sure to not make the same mistake. The Silence of Bonaventure Arrow is now officially one of my all-time favorite books. 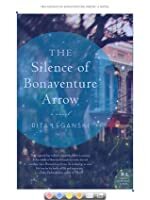 A well-written book of magical realism with fully-fleshed out characters, The Silence of Bonaventure Arrow is a tale of forgiveness and healing centered around a boy who does not speak but has the most incredible gift of hearing. I could never do justice to a review for The Silence of Bonaventure Arrow, and surely not as well as Will Byrnes (whose review follows mine), so please read his review while I put my energies into wishing this story had no end. I absolutely loved this novel. Oh my golly. It is magical, sad, sweet, and full of so much wonderfulness that I can't describe it. Definitely for fans of Alice Hoffman and Sarah Addison Allen. Magical realism has become my favorite genre and this book by Rita Leganski is a perfect example of why I enjoy it so much. This book is filled with love, faith, secrets, voodoo, and magic that feels very believable in this touching story. Bonaventure Arrow stole my heart from the very beginning of this story and I loved how he could not talk but could hear so much. Some of the most beautiful sections of the book are the ones that describe the wondrous things that Bonaventure can hear. Bonaventur Magical realism has become my favorite genre and this book by Rita Leganski is a perfect example of why I enjoy it so much. This book is filled with love, faith, secrets, voodoo, and magic that feels very believable in this touching story. Bonaventure Arrow stole my heart from the very beginning of this story and I loved how he could not talk but could hear so much. Some of the most beautiful sections of the book are the ones that describe the wondrous things that Bonaventure can hear. Bonaventure has a good life living with his mother Dancy who adores him and his father's mother Letice who also loves him very much. Their is a sense of sadness that lives in the house also though because of the loss of Dancy's husbanad and Bonaventure's father William in a terrible shooting right before Bonaventure was born. The book was so interesting to read with the love that all three have for one another living along with the sadness and guilt that Dancy and Letice cannot let go of. Bonaventure's father also cannot let go and his spirit is constantly in the house, the only one that knows he is there is Bonaventure who can talk to him in his own special way. William realizes he needs to do a few things before he can go to heaven and he needs Bonaventure's help. The two of them work together to bring healing to their family. I can honestly say that this is one of the most moving books I have ever read. It is beautifully written and I loved how Leganski took so many different lives and wove them all together into a beautiful story about love, loss, and forgiveness. I know I will be thinking about this book for a long time and I would recommend it to anyone who enjoys stories of families with a little magic put in to make a really wonderful story. Books that break the adage of “Show, Don’t Tell” rarely work. But, somehow this massive amount of telling, coupled with little actual showing, works wonderfully well here! This debut novel which is steeped in magical realism in a rich, Louisiana setting provides a charmingly entertaining read. The Southern flair and hints of magic function impressively well to make this book such an absorbing read. That Southern setting and flair is all the more impressive considering the author currently reside Books that break the adage of “Show, Don’t Tell” rarely work. But, somehow this massive amount of telling, coupled with little actual showing, works wonderfully well here! This debut novel which is steeped in magical realism in a rich, Louisiana setting provides a charmingly entertaining read. The Southern flair and hints of magic function impressively well to make this book such an absorbing read. That Southern setting and flair is all the more impressive considering the author currently resides in the Chicagoland area and grew up in Wisconsin - hardly Bayou country. But the heavy-handed narration and the lush setting combine to create a really entertaining and lovely book. Beautiful story told in a deceptively understated, dreamy way that lulls the reader into thinking not much is going on....but so much happens! Bonaventure Arrow is born unable to speak but he hears everything, and his hearing becomes more acute as he grows older. His family includes his mother and two grandmothers, all very nuanced and fully fleshed out characters. Bonaventure reminded me of Owen Meany (A Prayer for Owen Meany) in a good way! This book managed to touch on so many social issues wi Beautiful story told in a deceptively understated, dreamy way that lulls the reader into thinking not much is going on....but so much happens! Bonaventure Arrow is born unable to speak but he hears everything, and his hearing becomes more acute as he grows older. His family includes his mother and two grandmothers, all very nuanced and fully fleshed out characters. Bonaventure reminded me of Owen Meany (A Prayer for Owen Meany) in a good way! This book managed to touch on so many social issues without being forceful about anything, the author has a light touch! There was so much to think about - great book for discussion. Leganski is a master at descriptions, we see, hear, feel and smell what the characters in the novel are experiencing. There are secrets, there is a love story, a mystery, and humor, and everything happens for a reason. It's one of those books that shakes up your insides, and after the book ends, you can only conclude that where they said AUTHOR they meant MAGICIAN, because only a person capable of spells and magic could possibly conjure up such feelings of sadness for fictional people. You know Rita is a gifted author because in just a few pages she brought romance to life between Dancy and William so bold it rippled throughout the rest of her novel, despite the unfortunate event that unfolds. My favorite part was toward the end, where Dancy and William "dance" in her beauty parlor for the last time. It will be one of those book-moments that haunt me forever. I tear up as I type this, just remembering that part of the story. I also loved the gris-gris scene. I must have read it over a handful of times before I moved on to the rest of the story. So powerful and lovely. Unique. 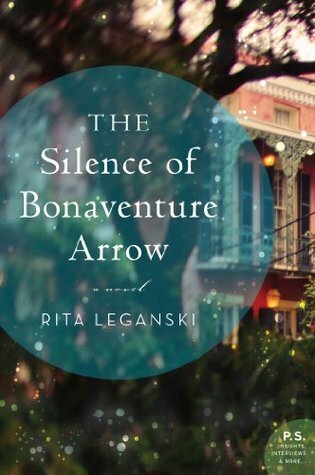 I'd sure love to meet this lady Rita Leganski, someday, just to tell her in person how much I adored her Bonaventure Arrow. I LOVE this book. It is a darling lyrical gem of beautiful language and gentle philosophy about how the characters deal with the currents in their lives. I remember thinking that the author must have had so much fun coming up with images for the things Bonaventure could hear. I am so glad I listened to the audible version; the narrator, Maggi-Meg Reed, was perfect and found distinct voices for the characters. I wish they had cast her to read the Hunger Games trilogy. I am adding this one to my f I LOVE this book. It is a darling lyrical gem of beautiful language and gentle philosophy about how the characters deal with the currents in their lives. I remember thinking that the author must have had so much fun coming up with images for the things Bonaventure could hear. I am so glad I listened to the audible version; the narrator, Maggi-Meg Reed, was perfect and found distinct voices for the characters. I wish they had cast her to read the Hunger Games trilogy. I am adding this one to my favorites list and will look for more from Ms Leganski. The protagonist is Bonaventure Arrow who can hear better than most people, but doesn't use his voice to share what he knows. The story revolves around Bonaventure's life without his father. His mother and his paternal grandmother raise him in 1950's Louisiana. There is healing that needs to be done on everyone's part (except for Bonaventure) and the unfolding of these story lines is done with congruity. I love the characters here and I love the lessons of acceptance and moving through grief to the The protagonist is Bonaventure Arrow who can hear better than most people, but doesn't use his voice to share what he knows. I love the characters here and I love the lessons of acceptance and moving through grief to the other side and healing. This is certainly a beautifully written story by a truly talented author, so I understand the high ratings, if you enjoy this genre. The magical realism, voodoo & hoodoo, and the supernatural aspects just do nothing for me these days; but I loved the ending and the life lessons Leganski was attempting to portray. Some very loveable characters as well. Absolutely breathtakingly beautiful. I have no words. This book is set in New Orleans which makes it even more appealing to me. I love books set in the south. The culture, the language, the food, everything about New Orleans good and bad is represented. It is a very detailed story with lots of prose. Be ready to really have to focus and pay attention to every detail. Hard life situations represented in this book but loved it to the very end. Recommends it for: Anyone and everyone, whether you believe in the supernatural or not. Although it doesn't seem to show up here, I did review this book. I was so impressed by Rita Leganski's writing, and I found the story to be incredibly compelling. I couldn't put the book down. Some individuals may find fault with it for the way it "suspends reality" in giving Bonaventure powers of super-natural hearing. But having grown up with a father who was raised in the deep South, I know that the culture there sees things differently. Hearing about my dad's childhood, I learned that most p Although it doesn't seem to show up here, I did review this book. I was so impressed by Rita Leganski's writing, and I found the story to be incredibly compelling. I couldn't put the book down. Some individuals may find fault with it for the way it "suspends reality" in giving Bonaventure powers of super-natural hearing. But having grown up with a father who was raised in the deep South, I know that the culture there sees things differently. Hearing about my dad's childhood, I learned that most people were quite religious, yet there was a belief in the ability of potions to cure or do harm, and visits were made to soothsayers to find missing items. This was an accepted part of his childhood. And so, for me, the idea that Bonaventure has incredible hearing, and other characters in the book have strange ways of doing things, was not unacceptable, but just an example of the culture. The way that Rita Leganski approaches Bonaventure's hearing, and her descriptions of what he learns as he listens to things, is incredibly lyrical and beautiful. It is some of the best writing I have ever read. I was impressed! The story is a romance, a coming-of-age story, and at the same time, a mystery about the happenings of Bayou Cymbaline and the identity of the wanderer and the reasons things occurred. It was so compelling. I had a difficult time putting the book down. The descriptions of the characters and the day to day life in the small town were fascinating. I was able to recognize why my father grew up feeling that there was a magic, another dimension to his childhood. It was verified when I read Rita Leganski's words. 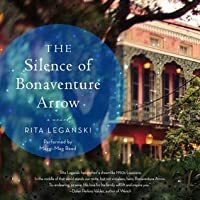 I have read other individual's reviews of THE SILENCE OF BONAVENTURE ARROW, and I believe they are wrong to assign a political leaning to the description of Leticia's experience in New Orleans. It's merely a description of the culture--the inability of people to fit into a society where black women were loved by white men, but not recognized by them as being equal. This is a book about the 1950's, a time when there was no equality of the races, and yet there was still that longing to be equal, to be accepted. There was also bitterness when one was rejected because of race. But that is a side issue in the story. Bonaventure is really about the magic of one boy's ability to hear all that the world has to offer. It's about his goodness, and his inability to harm anyone or anything. It's not a religious story, even though some characters in the book are religious. Rather, it shows hypocrisy, and the harm it can bring. And most of all, the healing that honesty and love can give. Rita Leganski holds an MA in writing and publishing and a BA in literary studies and creative writing from DePaul University. She teaches a writing workshop at DePaul's School for New Learning and was a recipient of the Arthur Weinberg Memorial Prize for a work of historical fiction.